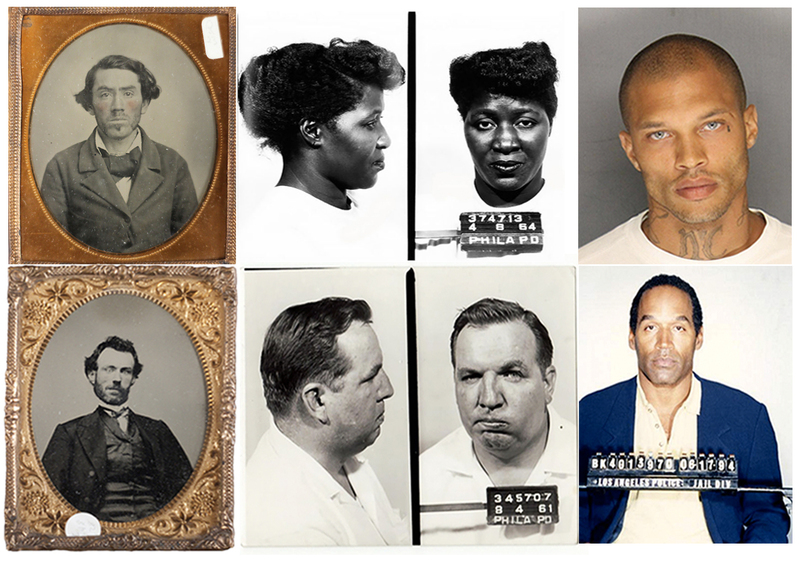 In the mid-1800s, it became common practice for the first time to photograph people who had been arrested - not necessarily charged - generally in a style indistinguishable from the studio portraits of the day. These images were regularly displayed in "rogues' galleries," frequented by members of the public, who considered them a form of cultural entertainment; but for the subjects pictured, these shows had damning long-term effects, as the presence of their portraits at such events all but confirmed their guilt to the courts. Today, websites like Mugshots.com have become the rogues' galleries' less artful modern equivalent, imposing a life-altering criminal stamp on individuals' digital footprint, regardless of subsequent charges. Meanwhile, the FBI's over 4-million-image face-recognition database includes mug shots, drivers' licenses, and visa and passport photos, the subjects of which are predominantly innocent of any crime. Given the disproportionate number of minority arrests in the US and the malfunctioning of most facial recognition technology when applied to dark-skinned subjects, these platforms are imbued with demonstrable prejudice whose origins might be illuminated by looking back at historic methodologies for systematizing the "criminal type." This exhibition aims to examine the entwined history of photographic portraiture and criminality, as well as the inherited legacy of systems operating on the basis of 'criminal until proven innocent' and the rules of aesthetics that reinforce them. Allan Sekula notes the moment that 19th century photographic practitioners became aware of the medium's instrumental potential as "a silence that silences" - a form of unassailable "mute testimony" quickly co-opted by the medical and criminal justice systems as a means of charting and predicting different forms of aberrance. The concurrent rise of photographic portraiture, newly available to the lower classes, spurred the construction of an archive of criminal typologies, and secured this new panoptic system of representation as one that whose honorific and repressive functions were inextricable. By establishing supposed human norms, photography in this way came to delimit "the other," and with portraiture has often toed a delicate line between reinforcing and representing difference. The historic safeguarding of a bourgeois social order through the standardization of criminal portraiture provides a backdrop for understanding how longstanding power structures can be read in modern identification documents, facial recognition technologies and other tools of the criminal justice system. This exhibition will pull together artists whose work interrogates these tools and formats, their inbuilt biases, and the prioritization of uniformity over unique features in their representation of individuals. Zora Murff's unconventional portraits examine how privacy and control over one's image can affect the future of 'criminal' youths. Raul Gschrey creates composite photographs from portraits of a city's residents, which can be converted into wearable masks that prevent successful biometric recognition. Soheila Sokhanvari compares how wealth and power are reflected in different countries' passport designs and questions the idea of 'reading' a portrait in the context of one's nationality; while Kalpesh Lathigra's passport-style portraits of displaced Syrian refugees at the Za'atari camp simultaneously affirm his subjects' status and reduce them to types. Elizabeth Breiner is a critic and curator, and editor / co-founder of the photography platform nineteensixtyeight, where she works with emerging artists and curates digital and physical exhibitions. She was previously the editor of Fotoura and worked for the London Festival of Photography, in addition to writing for a range of publications, collaborating on artist books, and serving as a competition judge and portfolio reviewer. Recent exhibitions include The Parallel State, shown at Les Rencontres d'Arles 2017, with a reconceived version of the show forthcoming at Benrubi Gallery, New York in 2019. A graduate of Vassar College and University College London, she is currently based in London.